Independent Musicians stories at Techdirt. stories filed under: "independent musicians"
We've discussed in the past a favorite talking point of the RIAA, claiming a 40% decline in employment for musicians over the past decade or so, which simply isn't supported by the numbers. We've been seeing a lot of people claiming this again lately, so we decided to take a look at what the numbers actually showed, and can't seem to figure out where that decline is coming from, because the numbers show a very different story -- one that suggests things are actually much better for independent musicians than in the past, just as we would expect. In fact, there's been an astounding 510% increase in independent musicians making their full time living from music in just the past decade. It's important to note, of course, that very, very, very few people get to make a living as a professional musician. That's just the unfortunate reality of the market. 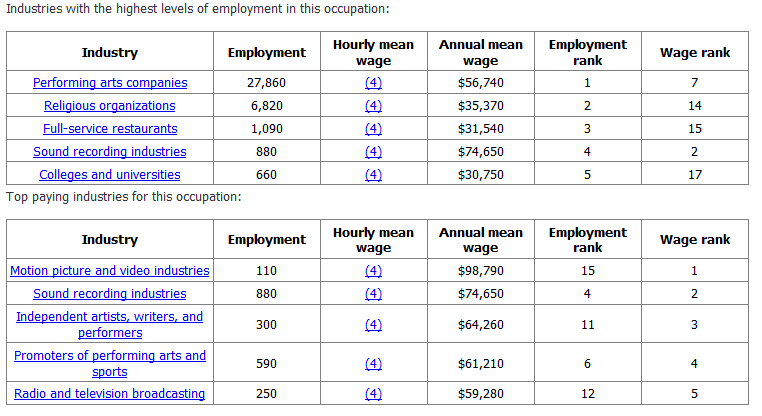 But understanding where that employment comes from is important. The RIAA, rather bizarrely, relies on the top line numbers for "musician employment" to make their case, but nearly all of those musicians are not musicians who are associated with RIAA member labels at all. Let's dig into the numbers a bit and see what we find. The top line there does show a decrease in full time musicians and singers, overall, but it's a drop of 16.7%, nowhere near the 40% (or, even higher) numbers some claim. Anyone claiming a bigger drop from these numbers is doing something wrong. Because when you compare the same numbers a decade apart that's the drop you get. 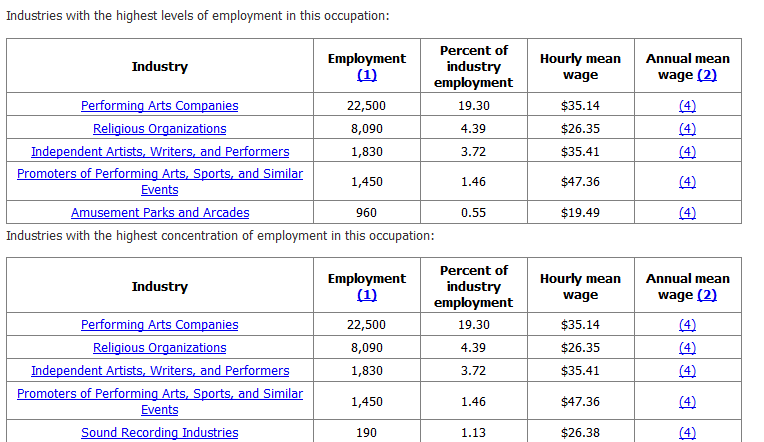 If you look at what the jobs actually are in this industry, the largest chunk, by far, are musicians employed by "performing arts companies." These are theater orchestras, symphonies and the like. They are musicians (very, very good ones), but they're not the kind of musicians the RIAA is talking about when it talks about musicians. That industry (performing arts companies) is definitely dealing with a bunch of challenges of its own related to continued funding, getting paying guests for shows and the like, but those are very different from the challenges that the internet creates for recording artists, which is what most people are talking about when they have this discussion. A big part of the "decline" in full time musicians comes from these performing arts groups, however, going from 27,860 down to 22,500. The second biggest chunk of this number is also not what people generally think of in this area either: religious organizations. So, let's look at the kinds of musicians that most people think are being talked about when discussing musician employment: musicians in bands that record/release songs/albums, perform and tour, and that kind of thing. 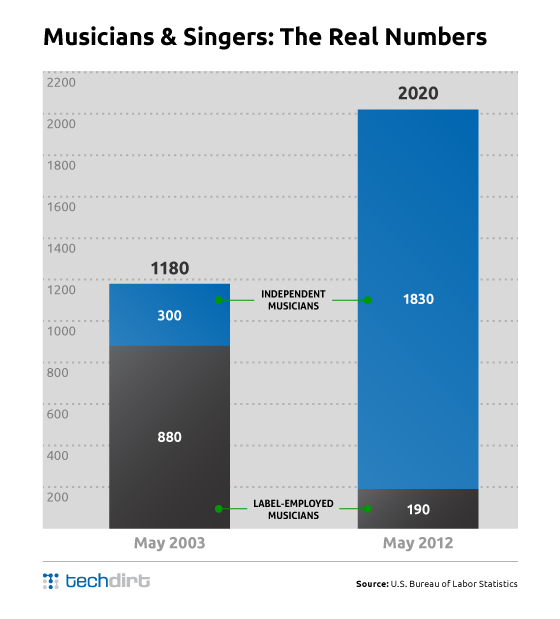 Remember, these numbers are very, very small, because the BLS is only looking at full time musicians, and there just aren't that many people who make a full time living as a musician outside of working for a performing arts company. Back in 2003, the "sound recording industries" (i.e., the labels) employed a grand total of... 880 musicians. Across the entire country. Note, too, that this was the high point of the industry. The idea that the RIAA is some huge supporter of musicians when at its peak it didn't support more than 1,000 musicians really says something, doesn't it? A decade later that number is, indeed, way down: 190. The major labels aren't supporting very many full time musicians at all. 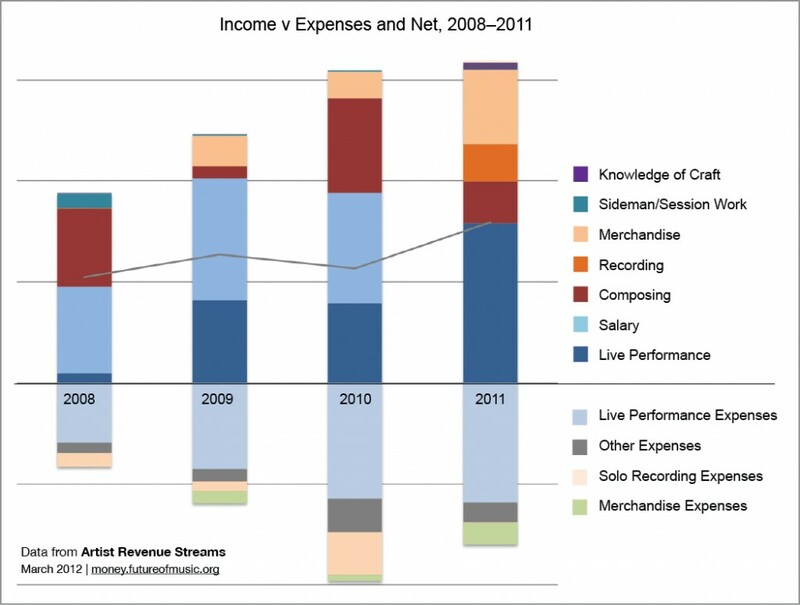 But, much more interesting is the corresponding explosive growth of independent musicians. Back in 2003, it was a mere 300. But, by last year it was 1,830. In other words, over the past ten years, there's been decided growth in full time musicians of the type that we're normally talking about -- those creating and releasing music. In fact, it's grown 71% from 1180 in 2003 to 2020 in 2012, and the massive growth is seen in the area of independent artists who have much greater choice and control in their careers. And, it seems worth noting that the equivalent mean wage of an independent artist is significantly higher than one employed by the labels -- $35.41 vs. $26.38. Mean numbers are a bit meaningless since all sorts of things can be hidden in the mean, but on the whole, the numbers look pretty good. Now, there are plenty of caveats to go with this, since many, many musicians who release music are unable to do so full time, so they don't show up in this chart at all. But by all indications more part time artists are also earning more money than ever before as well, with thousands of artists now being able to make some money, whereas in the past they couldn't make any. Of course, it would be great to get even more artists making a full time salary, but the argument made by the RIAA and others that now is a bad time to be a full time, performing musician, making and releasing music, just doesn't seem supported by the numbers. It sure looks like there are many more full time, performing musicians now, it's just that many of them are independent (and making more). The highest proportional returns to artists corresponded with the use of multiple inter-linked sites, including a dedicated website or blog as well the use of mailing lists and the provision of free content. Of the artists studied, few had developed this type of integrated or strategic web presence and many of the artists studied could be making more effective use of the tools available to them. When viewed in isolation, the use of popular web services such as Myspace, Facebook and YouTube to promote an artists music did not correspond to a dramatic increase in artist earnings. In fact, as a whole, users of Myspace or Triple J's popular Unearthed website actually received proportionally lower returns than the median. However higher levels of fan or audience engagement -- for example in the form of Blog coverage, YouTube views, Facebook fans or Myspace friends -- tended to correspond to proportionally higher artist earnings inclusive of services whose users tended receive lower returns overall. Finally, the level to which higher earnings corresponded to online activity appears relative to artists off-line profile. That is, artists who perform and tour regularly, receive radio airplay and off-line press and media coverage tend to receive significantly higher returns and appear more likely to benefit from online promotional activities. Most of this should be pretty obvious -- the more you connect with fans, and the more you do to get heard, the better off you're likely to be -- but it's amazing that so many musicians still don't bother with putting in the necessary effort.